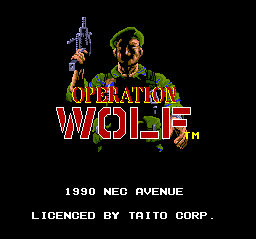 In this installment, I'm going to take a look at Taito's PC Engine port of its classic coin-op, Operation Wolf. It came to the US as a cartridge for the NES and on several home computer platforms, but this superior version never saw release on our shores. After that, we can quit or go back into action, selecting a level and starting the battle anew from scratch. 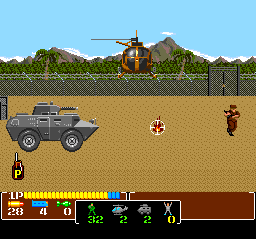 Operation Wolf is a solid, playable rendition of a popular arcade classic. And it's another one of those mysteriously Japan-only releases -- it wouldn't have taken any significant work for NEC and Taito to translate the remaining text, as the coin-op version had already come to the States. In this case, I imagine Nintendo's notorious North American exclusivity clause was to blame -- Operation Wolf was likely to earn more on the NES than on the TurboGrafx-16, so it was a straightforward business decision on Taito's part. Still, it's another quality title that would have made a nice showpiece for the ill-fated TurboGrafx-16, but went MIA instead. In 2010, I really have to recommend the emulated version of the original coin-op available in Taito's arcade classics compilation for the Playstation 2 -- there's no good reason to play even a decent port when the original is readily available. 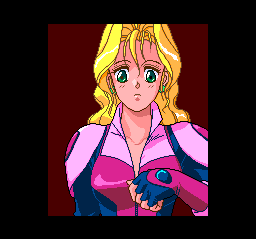 The PC Engine conversion isn't perfect, but it's well worth playing -- if you're interested, you might be able to find it here. The early 80's was a time of experimentation in the video game industry -- almost anything could be made into a video game, whether it was a good idea or not. Somebody at Creative Software apparently noticed that the movie Breakin' was doing decent business, while the company's plate-spinning game Chinese Juggler was gathering dust in the warehouse, all the cool kids being largely unfamiliar with the Ed Sullivan show. Which is all well and good, but Break Street isn't ultimately much of a game. Most of the fun comes out of just dancing around and pulling off the moves, and there aren't really any objectives or goals beyond putting together a sweet routine and recording it for posterity. It's just a straightforward simulation of break dancing, with one decent background tune and a handful of dance moves to master, making the most of the limited joystick-and-button controller. It was probably best when played with a friend, sharing the joys of nerdy wish fulfillment as one jockeyed a joystick around, imagining the joys of being hip and urban and even slightly tanned. But there's nothing necessarily wrong with a "game" that might more accurately be called a video toy. And Break Street is a LOT better than the competing Break Dance on the same platform, a game from Epyx (Summer Games) that sullied that company's stellar reputation with unrealistic animation, poorly-defined gameplay, and lousy music. Unfortunately, there was never a Break Street 2. Sigh. Okay. Give the people what they want and all that. Sure, Universal has a big-budget Asteroids movie in the works. But Kid Stuff records told the story first... and second. Now we're bringing it to the small screen. The Gaming After 40 video podcast is available free on iTunes, YouTube, and blip.tv -- online and on Roku set-top boxes! 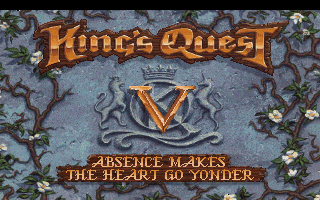 Time once again for our weekly adventure, as we continue our survey of Roberta Williams' classic 3-D adventure series, playing through King's Quest V: Absence Makes the Heart Go Yonder. 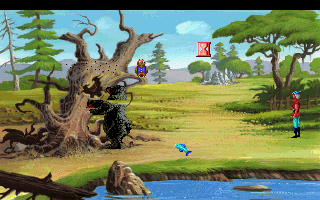 The game was Sierra's first major release to feature VGA graphics, allowing rich, painted backgrounds. The original diskette version was soon updated to become Sierra's second CD-ROM multimedia effort, following a smaller-scale VGA remake of Roberta Williams' children's title, Mixed-Up Mother Goose. KQV required some new technology - MUMG used a CD Redbook soundtrack, but KQ5 had too much dialogue and narration to fit on a single audio CD, so the content was compressed to a lower sample rate and played through a sound card, with the SCI engine upgraded to treat digitized playback separately from the music hardware. Unfortunately, the technology is promising but the execution is weak. Bandwidth and hence audio compression is tight, with less than 100 MB of space for more than five hours of sound -- dialogue is noisy, hissy, and messy-sounding throughout. And the voice acting is far from great -- most of the characters are performed by in-house Sierra staff, and few of the amateur actors are really able to inhabit their characters. Most of the dialogue sounds "read-y," and there are some odd pauses, as though only one take was permitted and the performers were caught still familiarizing themselves with their lines. Josh Mandel does a capable job as King Graham, and there are some interesting voices in the cast -- but it would take Lucasarts' professionally-acted LOOM to demonstrate the real potential of voice acting in adventure games Here, it still feels like a novelty that doesn't greatly enhance the experience. 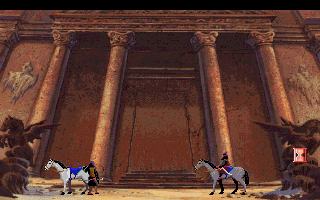 The move to VGA also has its drawbacks -- the painted backgrounds look lovely, but at VGA resolution the pixel boundaries are thrown into jarring relief whenever a character walks behind an object. The VGA palette allowed 256 colors, so the engine devotes 128 variable colors to the backgrounds and 128 fixed colors to sprites. It's a reasonable compromise, but there is consequently some graininess and color banding in the backgrounds, while the sprites take on a bright, cartoonish appearance. And as CPU speed and memory size were not necessarily up to the task of moving twice the graphics data around compared to EGA, sprite size and detail is actually reduced compared to the earlier Sierra games. There's a new "detail" slider on the options screen to match the incidental animation to the PC's capabilities, but the new look often literally distances the player from the action, with the voices in many scenes seeming much bigger than the tiny characters. The game also introduces a mouse-driven, icon-based interface, doing away with the text parser altogether. Heresy it may be, but I can't say that it completely ruins the experience -- most of the King's Quest puzzles are simple, and taking an object and clicking on a location or character does the trick with less frustration and fuss than keyboard entry sometimes required. It also has the effect of taking a lot of hypothetical solutions off the table, and making the experience more visual -- spotting a glint or an alcove in the background is often the only way to discover a useful item. But it does make the design less flexible, and the lengthy voice-over narration of each and every bit of "look" description gets old fast. It would be a while before "talkie", mouse-driven adventures found their footing as something more distinct from text-based interactive fiction. 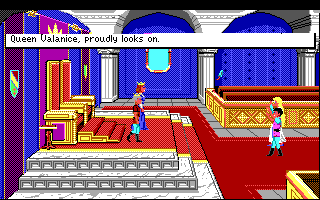 I played through both the VGA and CD-ROM releases of King's Quest V back in the day, enjoying the novelty of the new technology, and was looking forward to tackling it again for this post. 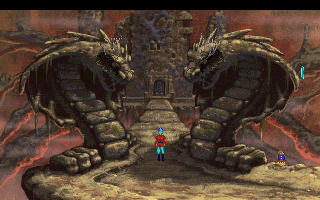 But I have to say I didn't enjoy revisiting the game as much as I wanted to -- the design once again recalls the very early King's Quest titles, with a large exploratory first act filled with random puzzles, leading to a more-or-less linear road to the finale. Twenty years later, it's easy to see that while the technology was dramatically improving, Sierra's approach to game design was stagnating during this period of transition. The story concerns King Graham's attempt to rescue his castle and family after they are spirited away by the evil wizard Mordack, in retribution for Alexander's escape from his brother Manannan way back in King's Quest III. From here on in, I'll be discussing the game in detail, and am likely to give away many puzzles and plot points. So if you wish to enjoy the game fresh, I urge you to go play it before continuing. 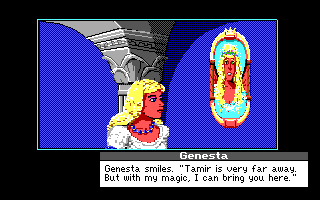 Roberta Williams' fairy-tale dialogue often sounds corny and awkward spoken aloud. Crispin the magician rambles on for quite a while as the game gets underway, then abruptly commands, "Here, eat this!" as he confers upon Graham the magical ability to communicate with animals. At another point, Graham exclaims, "Drat! My sled is broken!" Nobody talks like these characters do, and unimportant conversations sometimes go on for far too long-- Graham's exchange with a pie merchant is particularly unnecessary. The game uses close-up character portraits for many dialogue sequences, with good lip-synching for the time -- it's a small but worthy innovation that does bring the characters to life. 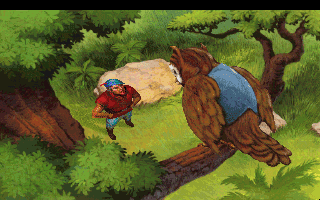 Graham's companion Cedric the owl is perhaps the most annoying character ever to appear in an adventure game. His voice is high-pitched and grating, and he doesn't do much that's useful -- occasionally he urges Graham on if he dawdles too long in one place, but mostly he panics and warns Graham of danger unnecessarily, or too late to prevent Graham's death. After he nearly dies toward the end of the game, the characters go on about their business for quite a while before remembering his lifeless body on the floor, and I can't say as I blame them. If, as I contend, Roberta Williams is the George Lucas of adventure games, then Cedric is her Jar-Jar Binks. That isn't to say that there aren't plenty of other irritating characters to meet and deal with. There's an ostensibly heterosexual prince bereft of his lady love, who warns of yet another evil witch who transforms Graham into a frog on sight with no opportunity for escape or defensive action. There's a poisonous snake, a frequent villain in Roberta's games, who can only be scared off with a tambourine Graham must go to ridiculous lengths to obtain. Ants and bees and a rat must be appeased to win their assistance, even though Graham offers only temporary "solutions" to their harassment by a dog, a bear and a cat, respectively. A purportedly German toymaker doesn't pronounce German words very accurately; a shoemaker complains of poverty and his wife says business hasn't been good, but he has no shoes on hand to sell, so SOMEBODY must be buying. A portly, complaint-spouting customer in the tailor shop looks a lot like Ken Williams, which at least provides some entertainment while we deal with the snooty elfin proprietor. 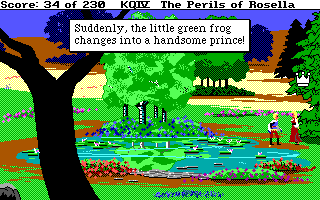 At least King's Quest V's map isn't quite as sparse as the earliest KQ games -- it's still very N/S/E/W in its layout, but there's a lot more visual variety and almost every room has something interesting to do in it. And the mazes are improved -- the desert to the west can be navigated, with enough oases to keep Graham alive as he explores, and there's a 3-D maze in the wizard Mordack's castle that provides a new mapping challenge. There's some fun incidental animation here and there -- if Graham wanders too close to the ant hill, he has to brush the insects off, dancing in a comical fashion that's ruined only by Cedric's subsequent lame joke. The puzzles follow Roberta's usual pattern -- find something of value, help someone out or trade it for something more germane to Graham's quest. The gnomes have a fancy marionette, a Gypsy fortune-teller offers advice in exchange for a gold coin, a weeping willow is a transformed princess, a bake house has pies for sale. There are also dangerous situations to which Graham MUST subject himself in order to complete the game -- getting knocked out by thugs, and entering a bandit treasure store, for example -- that readily supply fatal dead-ends if not handled correctly. There are also navigational puzzles, although the mouse interface now has decent auto-pathing and Graham can find his way around fairly complicated obstacles. The game still allows the player to direct Graham off of cliff edges, though, and there are several trial-and-error movement puzzles with fatal consequences for wrong steps. 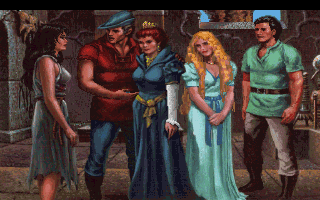 A trivia note: King Graham visits the Village of Serenia, the setting of Ms. Williams's Wizard and the Princess/Adventure in Serenia adventure game back in the day. It's much more populated now, and Graham can actually visit three shops, whereas the town itself was window dressing in the older game. There is a haystack, in which Graham must of course find a needle. Searching it directly is unproductive, but if he has assisted the ants, King Antony and his troops will show up and sift through the stack on his behalf. They sing a little song while they work, and it's pleasant enough, but I have no idea how they manage to whistle with those rigid mandibular mouth-parts. After the bear is sent away by tossing it a fish, Queen Bee-atrice appears. She sounds like Zelda Rubinstein (Poltergeist) and allows Graham to take a piece of honeycomb -- he wraps it in a protective piece of cloth that materializes from nowhere. I guess someone felt that having him carry a glob of honey and beeswax around in his pocket was even less realistic, or perhaps he tears it discreetly from his garments and is too polite to mention the player's failure to provide him with an alternative. The desert to the west contains a bandit hideout that's quite dangerous. Graham needs to hide behind rocks or he will be killed by the bandits on horseback; after watching them open the temple with a magical staff, Graham must sneak into their camp and steal it. THEN he must get into the temple, breaking the staff in the process, and grab TWO critical items quickly before the door closes up again. I replayed this section several times before getting everything right. And of course, rubbing the brass bottle produces a ticked-off genie who permanently imprisons Graham in the bottle -- it's meant to be given to the witch so she can be disposed of. The witch presents a challenge herself -- she appears semi-randomly in the dark forest, and I at first though I could get past her by saving and restoring. But she always appears at the bridge in front of her house, and Graham will be transformed into a frog yet again if he doesn't have some magical protection. A bluebird in the forest "could almost make Graham happy again, if it wasn't for his family." I don't think that's what Ms. Williams really meant to say. Graham demonstrates once again that members of royalty, even heroic royalty, can be jerks on occasion and tend to deal with witches in an extremely prejudicial fashion. He's very sarcastic when the witch claims she owns the forest, as if such a thing could not be possible. And he certainly does not respect her property rights, casually invading and ransacking her home after she's bottled up. Value is always extremely relative in these games, based more on what people have and want than any realistic economy. Trapped in the forest, Graham must trap an elf to escape, by tossing out emeralds and smearing some honey on the ground to snare the little man. After crawling through some underground tunnels to the land of the elves, Graham proceeds to extort a pair of valuable shoes from the little people. Why? Because he needs to give them to the shoemaker, granting the man and his wife a cushy retirement in exchange for... a cobbler's hammer. Roberta! Similarly, the toymaker doesn't want the exquisite miniature spinning wheel Graham has found, for some unspecified reason, which means the gnomes must want it, which proves true. Graham exchanges it for the gnomes' marionette and trades that to the toymaker for the sled. Graham seems awfully anxious to have the sled, though there's no clear reason why he should at this point. Maybe it's a Charles Foster Kane thing, although that's more about Queen Valanice than I want to know. The game's first act is open, with lots of opportunities to explore and solve puzzles, and two three-puzzle sets involving animals and merchants. I finally reached a point where it seemed I had dealt with everything except the bandits in the inn, which required rescuing the rat from the cat so it could in turn rescue Graham from the basement. Graham, of course, has to suffer through this in order to obtain some rope and a leg of lamb. Once Graham is pimpin' in his velvet cloak and wandering through the snowy mountains, the game becomes much more linear. Graham must climb a cliff, tying his rope to a rock outcropping and not fatally to a branch; then he must jump across some small frozen steps, saving and restoring frequently, as some of them break away, plunging Graham to his doom. Oddly, the hand icon must be used to leap from one step to another -- using the walk icon is fatal, as Graham just tries to walk across thin air. Then Cedric gets kidnapped by a wolf, and while it's tempting to just let the darn bird go, Graham also gets corraled and brought to Queen Icebella, who demands he take out a troublesome Yeti before she will free him (and Cedric, curse the luck.) This is accomplished in slapstick fashion by throwing a pie in the abominable snowman's face, causing it to tumble off the cliff and raising serious questions about Queen Icebella's ruling acumen and assistance-seeking tactics. Perhaps this is why all of her subjects seem to be wolves. King Graham specializes in temporary solutions, and in this game he's all about creatures owing him a favor. Encountering a starving eagle, he gives the creature a half-leg of lamb. What ever happened to teaching a bird to herd sheep? Later, the eagle rescues him from a Roc's nest in return. The next leg of Graham's journey is by sea, and there's no way to tell that the boat he finds has a hole in it until he launches the unseaworthy craft and drowns. It's apparently a small breach, as it can be fixed with beeswax, which is surprising given how quickly the boat sinks if it hasn't been repaired. The sea serpent is nasty and seems aggressive, but always shows up in the same locations -- it's really just a mapping challenge to discover a safe route across the ocean to the harpies' island. Cedric gets injured along the way, continuing to make a burden of himself, and Graham is the subject of some disturbing speculation among the winged ladies. Next, Graham goes back to the beach and seeks assistance from a hermit, who is hard of hearing and must be aided with a conch shell (something which apparently never occurred to the elderly beachcomber.) He patches Cedric up with a remarkably efficacious poultice, and summons Pearl the mermaid to lead Graham to Mordack's island. The hermit is kind of an interesting character, though apparently not to Roberta -- when Graham tries to thank him, saying "Mister...", he responds, "Never mind who I am!" Whatever his story is, it will not be explored in this game. The game's climax approaches as King Graham lands on Mordack's gloomy isle. At this point, it's mostly a matter of using objects Graham has acquired in his travels and finding other handy items as needed. And again, the puzzles are somewhat arbitrary. Giving the tambourine to a monster in the maze causes it to dance and depart, leaving a hairpin behind for lock-picking purposes. 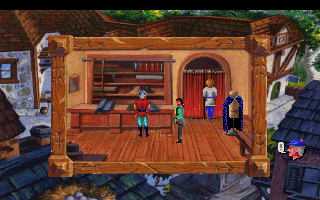 Giving a locket to the scullery girl reveals that she is Princess Cassima of the Green Isles, setting up King's Quest VI. A bag of dried peas in the pantry is used to trip up a nasty blue monster temporarily, and for some reason this is the only method Graham can use to empty the bag of peas so it can be used to bag Manannan (still a cat). Graham must allow himself to be thrown into the dungeon once (ONLY) to acquire a critical piece of cheese. Graham's interaction with Mordack is very reminiscent of the Alexander-Manannan tension in KQIII, except there's no real time pressure and the hazards are largely random. Mordack can choke Graham from a distance if Graham is so foolish as to play the organ and attract his attention, and Graham must wait in the wizard's library for him to show up and nap, so he can steal Mordack's wand and use it to recharge his own. 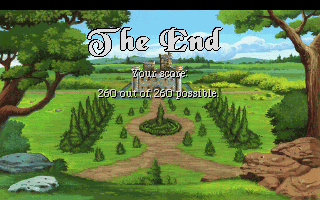 Unlike the earlier King's Quest games, King's Quest V doesn't seem to have any optional puzzles or alternative solutions; I finished with a score of 260 out of 260 possible points. The end credits cycle repeatedly, and it's interesting to see that Roberta Williams herself voiced several characters. There's a nice closing medley of themes from the game that plays under the credits. To be honest, I think I'm getting a little burned out on King's Quest, but it's an influential series and I intend to play through the games I have on hand. KQ VI will be the next one up for discussion here, at some point in the not-too-distant future. WiiWare -- 2 new games, or six, depending on how one counts them. The clearly-titled 5 Arcade Gems presents five arcade-style action games -- they're not licensed, but judging from the descriptions the designs are borrowing from Timber, Warlords, and Paperboy among others. Brain Drain is a descrambling puzzle game. Wii Virtual Console -- Another solid Neo-Geo fighter arrives on the Virtual Console: The King of Fighters '95. DSiWare -- A whopping six new downloadable games arrive for the DSi this week -- it's clearly proving to be a viable platform for publishers. Ferrari GT: Evolution is a racing game with licensed vehicles at a premium price. DodoGo! is a Lemmings-esque action puzzler that makes interesting use of the stylus. System Flaw Recruit is a shooter that uses the DSi camera to incorporate images from the player's surroundings. Don't Feed the Animals is a tower defense contest with a funny backyard animal invasion theme. Puffin: Let's Roll is a motion-control maze game a la the classic wooden Labyrinth puzzles. And Scrabble Slam! is a multiplayer Scrabble contest where speed is of the essence. XBox Live Arcade -- Two games last week. Puzzle Chronicles is a puzzle/RPG game in the vein of Puzzle Quest. Sega's After Burner Climax updates the classic arcade air combat shooter with modern graphics and the addition of ground-based targets; I found the demo a little too frenetic and unfocused, but I've never been a big fan of the original either. Game Room -- Still quiet on the arcade front, but next week we are promised a batch of Atari 2600 titles from Activision and Atari. PS3 on PSN -- A big week last week, with four downloadable titles arriving on Sony's console. After Burner Climax and Puzzle Chronicles debut simultaneously with XBLA, and The Secret of Monkey Island: Special Edition brings more adventuring goodness to the PS3. Hyperballoid HD is exclusive to the PS3, with gameplay reminiscent of Arkanoid and Zuma. One item I haven't previously mentioned -- Nintendo has been releasing weekly "Big Name Games" for the WarioWare D.I.Y. platform -- they're simple, quick games created by big name developers, using the same do-it-yourself scripting tool available for everyone on the DSi. This week's game is from the Super Meat Boy team, last week's came from WayForward, and the series is projected to continue through July 26th. Nice to see Nintendo celebrating talented third-party developers this way. Vic Tokai, Inc. produced a number of memorable games for the 8-bit Nintendo Entertainment System back in the late 1980's. 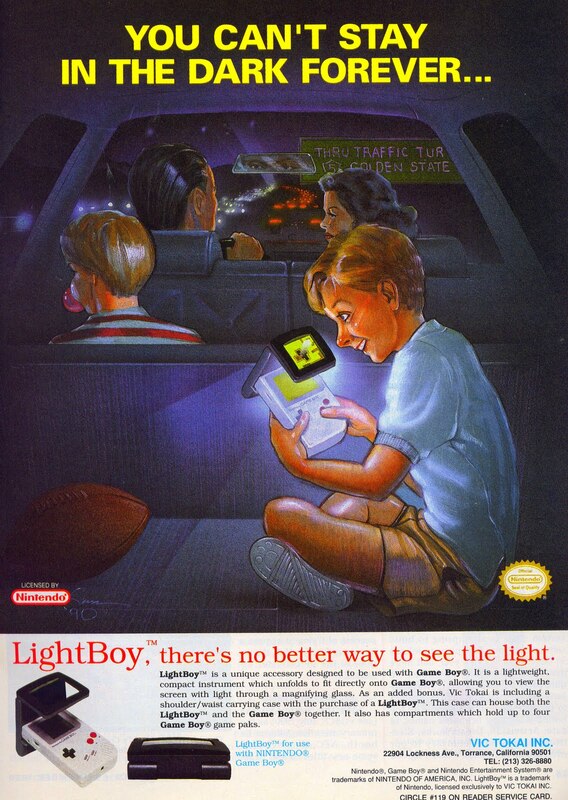 The company also produced the LightBoy, one of the many gadgets designed to throw light on the Nintendo GameBoy's muddy black-and-green LCD screen. You see, our hero's family is falling apart. Without the LightBoy -- that small, battery-powered piece of plastic that focuses and settles his jangled nerves -- he would have to face the encroaching darkness that surrounds him. The illustration makes that much clear. His parents are on an endless road to nowhere. His mother, bereft of dreams, mercilessly harangues his father as he tries to navigate the rush-hour traffic, fighting the urge to drive off the road, through the guard railing and into a nearby ravine. His dull, weary eyes are reflected in the rear-view mirror, as if to say, "I am tired. Tired of the stress, the money troubles, the fighting. So kill me now, highway gods. And kill this woman. Kill my entire family if you have to. Just make it stop." His older brother sits disinterested in the back seat, looking listlessly out the window, trying to ignore the ongoing conflict in the front. He blows a transparent pink bubble. But is it really bubble gum? It seems too transparent. Too neat, somehow. Extended consideration reveals that the older boy is a mule, an innocent drug smuggler, his stomach heavy-laden with its cargo of cocaine. You know what they call it on the street: Blow. And our hero sits in the very back of the family's station wagon. The football that his dad might have thrown for him to catch once upon a time, before the booze and the skanky other women, sits lonely and forgotten. The boy's delicate features, caught somewhere in the twilight between male and female, between Brad Pitt and Sandy Duncan, hint at the confusion that tears endlessly at his formative soul. For he is a hermaphrodite, and his ignorant, uptight parents are so embarrassed and ashamed that they force him to ride in the back, without a seatbelt, ensuring he will be the first one through the windshield if something goes wrong. The LightBoy is his only friend. It shuts out the rest of the world, the cruel, real world that force-feeds his nightmares and haunts his futile daydreams. But, as the ad ominously intones at the very top, he can't stay in the dark forever. Vic Tokai weeps for him. 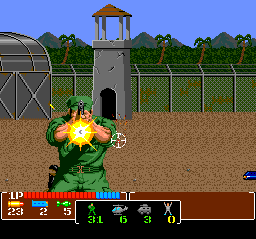 The game was produced and released by Sega for the Mega Drive in Japan, but for some reason came to the North American Sega Genesis through another publisher, Renovation. And the new publisher apparently decided that showing off Gain Ground itself was not a good idea. Note that the scant layout space devoted to selling the actual game contains no box art, no logo; the title is most prominently displayed using a generic font running down the page's right margin. And there are no screenshots, perhaps because Gain Ground's graphics were typical of that odd 8-to-16-bit crossover period, when a lot of 16-bit games still looked grainy and muddy. But when you're asking people to lay out $40-$60 for a game cartridge, it's reasonable to assume they'd like a little more information about what it is they're being asked to buy. There's some text describing a world at war, with enemies to battle and hostages to rescue across multiple time zones. 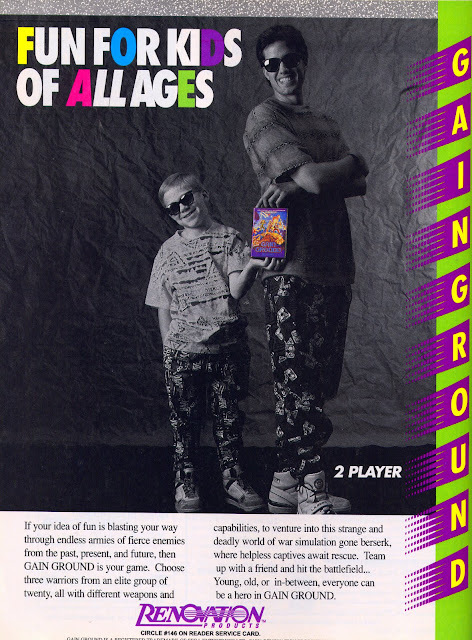 But the gameplay described is rather at odds with the father-and-son fashion crime imagery that dominates the ad. Remember, kids: elite warrior soldiers don't wear shades with pajamas and tennis shoes. This week, we take a look at a quality CD-based shooter for the Japanese PC Engine that (yet again) could have come to the US, but never did: Hellfire S: The Another Story. 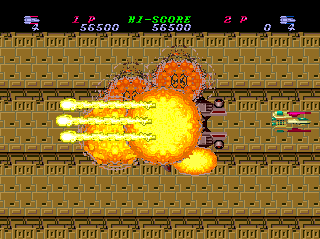 It originated as Hellfire, a coin-op arcade game by Toaplan, and did make it to the Sega Genesis via Seismic Software as Hellfire, but this enhanced version converted by NEC Avenue never turned up on the TurboGrafx-16. 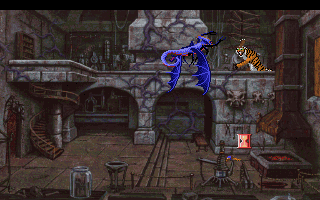 There's an extensive animated intro, and there seem to be very brief intermissions between levels, though I only managed to get past the first boss, so that's all I've seen myself. 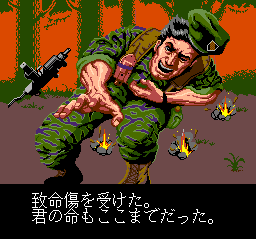 All the animations are fully-voiced, with limited sprite animation in the classic PC Engine style. The CD remix of the arcade soundtrack is nicely handled, and each track runs long enough that there's no obvious looping or restarting during a level. On my best run, I had five lives on hand as I entered the second level, but they were exhausted in very short order as soon as I got in trouble. This is one of those shooters where losing your power-ups makes it very difficult to recover, so I declared myself satisfied with my progress for the moment. 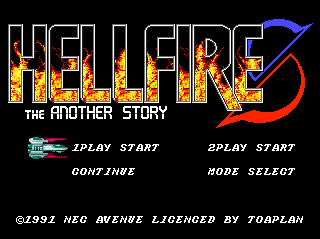 Hellfire S: The Another Story is a solid PC Engine title, on a platform that hosted more than its share of quality shooters. Bringing it to the US would have required some investment in translation and voice acting, and NEC/Turbo Technologies were wise to invest in Lords of Thunder and Gates of Thunder instead, which ran on the Super CD-ROM technology and were more sophisticated. But this would have been a worthy addition to the Turbo CD's generally weak launch lineup. For once, this is an import game I can wholeheartedly recommend. It's fast-paced, challenging and a classic old-school shooter. You may be able to find it for purchase at this affiliate link. For a slightly more Atari-centric perspective on the world of retro gaming and computing, be sure to check out the good folks at 8-Bit Rocket. They run a quality site with lots of worthwhile content and news, and the proprietors know Flash a heckuva lot better than I do. In catching up on the world of Atari there, I was pleased to hear (even if only for nostalgia's sake) that founder Nolan Bushnell is reportedly returning as a member of that fabled company's board of directors. I'm sure it's not at all the same company he sold to Warner Communications back in the day -- it's been acquired, dissolved, split up and reconstituted at least 256 times now. But I can't help hoping that Bushnell will restore grand old undocumented and possibly urban-legendary Atari traditions like playing Go in the corporate hot tubs, testing new games in seedy little bars, and smoking weed in the software engineering department. It's not his first return, if memory serves -- I believe he designed an Atari 2600 game during Atari's late 1980's "red box era" -- but it's still cool to know he's going to be involved in some capacity. If that all works out, there's still hope for the restoration of Chuck E. Cheese's derby and the return of the Androbot. What are you laughin' at, 2-XL? 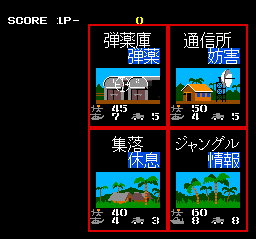 I've recently been playing Konami's 1982 arcade game, Tutankham, courtesy of Microsoft's Game Room on XBox Live Arcade. It cost me 240 points, US$3.00 in real money, and I'm happy with the deal. If you've never played Tutankham, suffice it to say that it's a 2-D maze game, pitting a plucky explorer against on onslaught of monsters as he searches for treasure in an Egyptian tomb. It was developed in Japan by Konami and distributed to US arcades by Stern in 1982. 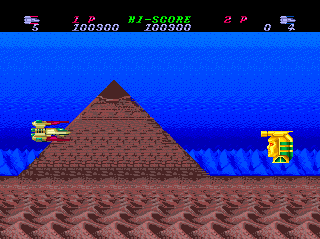 The Game Room trivia notes mention that the original title was Tutankhamen, but when the screen orientation was changed from horizontal to vertical, the existing title graphics wouldn't fit and the name was summarily truncated. I always liked Tutankham back in the arcade era, but never spent enough time with it to get good at it; I recall playing it once or twice at an RV/boat show in Green Bay, Wisconsin, and getting my pith helmet handed to me rather quickly. The graphics and scrolling hardware were just far enough ahead of home systems that there was never an accurate port released -- the Atari 2600 version was so approximate as to not even feel like the same game, with vertical rather than horizontal scrolling and tiny indistinct sprites, and the -- ahem -- "inspired by" version I bought for the TRS-80 Color Computer was no touch on the original. So when Game Room arrived on the downloadable scene, Tutankham was the first game I opted to invest in. And it's a solid, old-fashioned game, balancing risk and reward carefully, giving the player just enough freedom and temptation to get into serious trouble. It's not a difficult game, but it's not easy either -- even with some practice under my belt, and all the gold Game Room medals earned, I still play an embarrassingly short round on occasion. Old-school videogames are all about limitations, and Tutankham's most devilish feature is that the player's adventurer is armed with a laser that can only shoot to the left and to the right, with only one beam active in each direction at a time. This means that timing is critical -- if you plan to dart up the corridor, shoot around the corner, and retreat, you have to execute those moves quickly and precisely. It's far too easy to run around the corner, miss, and run into the approaching monster as the laser beam shoots harmlessly beneath its feet, or find oneself being chased down a long vertical corridor with no means of defense. 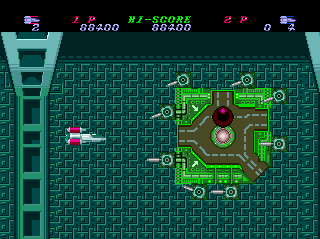 The player has a "magic lamp" smart bomb available, but only one per life, and it's possible to launch the weapon just a hair too late, so that the screen starts flashing with the explosion but the adventurer still gets taken out by an approaching bat or viper. The game also doesn't make it easy to STOP moving -- unless the character runs into a wall, he's always on the go, meaning that just keeping him in one place while waiting for an enemy to wander away or come into range can be a challenge. And the long vertical corridors in later levels ramp up the difficulty quite a bit -- the adventurer is defenseless while moving through these channels, so if a fast-moving bat is on his tail as he enters one, he's not likely to make it to a defensible position in time. The Game Room medal standards for Tutankham aren't outrageously difficult to meet. 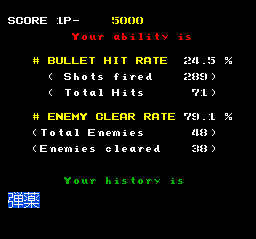 Getting through the first two levels and partway into the third is sufficient to earn the 30,000 Point Buster gold medal, and most likely the four-minute Survivalist gold as well. The online leaderboards are another matter -- I've gotten nowhere near the fourth and final level, after which the levels recycle at a higher difficulty, but it's clear that some people have. But like a lot of XBox 360 achievements, the motivation to continue playing tends to fade after these goals are reached. I've gotten plenty of pleasure out of Tutankham, and will continue to do so when the mood strikes. For three bucks, I can highly recommend this one. A look at Midway's direct marketing circa 1997. In this installment, we're looking at an adventure created by a talented young programmer named Greg Hassett for the TRS-80 Model I computer. His games were self-published, under various company names like Mad Hatter Software and Adventure World, between 1979 and 1982, when Hassett was reportedly 12-14 years of age. One of Hassett's first games was The Enchanted Island -- for this post, I played through his later revision, ENCHANTED ISLAND-PLUS ADVENTURE, rewritten in assembly language for much-improved speed. It's wise to heed the advice displayed at start-up -- we can go S into the ocean if we like, but we immediately drown and are sent to THE LAND OF THE LOST ADVENTURER, where we are advised to quit and restart as there is no way back. The same thing happens if we go D from a cliff later on, or wander out of the marsh into the ocean, though there are no friendly warnings provided in those situations. As it turns out, if we have the +MAMMOTH RUBY+ in hand when we die, we can SAY BIMBO to return to the land of the living and continue the game. The game has a fairly large map, but really only features one type of puzzle -- every treasure is guarded by some kind of creature or obstacle, and we must figure out how to get him/her/it out of the way so we can get our hands on it. Hassett provides quite a few clues, but he likes to obscure them by interleaving or rubbing out part of the text. Thus, an old book reads MAGIC BREAK WORD BOTTLE "BIMBO", a big rock has text reading WARLOCK SLIP. HIT DEER., and a note reads HOLY SMOKES, A TIGER! BARBS LIKE BAN... (THE INK ON THE REST OF THE NOTE IS TOO FADED TO READ). All will come to make sense in time. 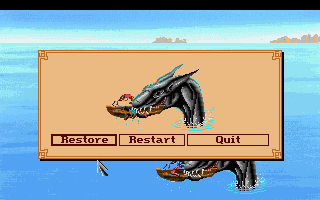 I played ENCHANTED ISLAND-PLUS using Matthew Reed's TRS32 emulator, and I suspect the game's save/load system is buggy, as the tape drive emulation has worked properly for me on other occasions. At any rate, my attempts to save to and load from tape didn't quite work as expected -- RESTORE seemed to bring my inventory back correctly, but never put me in the same room I was in when I did the original SAVE. And while the location it dropped me in (LOST IN A DARK MARSH) proved valuable, as it allowed me to visit and map out an area I hadn't figure out how to reach yet, I later learned that a couple of key items were not where they were supposed to be, and so were not on my map or in my inventory, which led me to beat my head against a couple of puzzles unnecessarily. There's a waterfall in this game that's just for decoration, which is a bit unusual -- almost every other adventure I've played that has a waterfall has a "hidden" chamber behind it. Young Mr. Hassett committed a few spelling errors to digital immortality here -- there's a MAGESTIC CHAMBER, and a room with a high CELING. One puzzle has no associated clue, but gives itself away in a more subtle way -- if we try to THROW almost any object, the game responds SORRY CHARLIE. I CAN ONLY THROW THE BALL. I hadn't found the ball when I first encountered this message -- it was one of the missing objects due to the aforementioned RESTORE bug -- but now I knew I should try to find it. The map is large, but the dictionary is not -- a lot of verbs and nouns aren't recognized, so experimental solutions tend to bounce off the parser. There's no GIVE verb -- we usually have to FEED or DROP items to hand them over to another character -- and in the phrase BURN GRASS neither word is recognized. There are some old-school arbitrary solutions to contend with. We can ATTACK anyone we choose, but our sally forth almost always ends in: WE ENGAGE IN A WILD FIGHT. WHEN THE SMOKE CLEARS I FIND MYSELF BEAT TO A PULP. I'M DEAD. But we can ATTACK BEAR and emerge victorious. The correct way to get to the marsh area is to hold the +MAMMOTH RUBY+, which is a magical transportation device as well as a treasure, and SAY BIMBO. We are given a couple of hints -- we OPEN BOOK, and A HOLLOW VOICE ECHOES: "THE RUBY WAS BIMBO'S." If we SAY BIMBO in the room where the ruby is found, it takes us to the marsh; if we say it elsewhere, it takes us to its original location, so it's a fairly efficient way of getting around. TIGER SMELLS SOMETHING...LOOKS AT ME WITH DISGUST, AND WALKS AWAY. Inventory management is important in this game -- we need to keep the +MAMMOTH RUBY+ and the LANTERN in hand most of the time for safety's sake, and I had to make several return trips because I couldn't carry all of the treasures at once. The vulture and the barbarian can both be fed -- the vulture likes the nondescript TASTY FOOD, and the barbarian likes the BANANA. He leaves the peel behind, which allows us to DROP PEEL in the presence of the Warlock, yielding WARLOCK SLIPS, FALLS, AND VANISHES and granting access to the +SILVER KEY+. I don't know why, but we need the BAMBOO POST and not the pick or our bare hands to HIT DEER -- at which point THE DEER RUNS AWAY...BUT SHE LEAVES SOMETHING BEHIND! It's a pair of +GOLDEN ANTLERS+, which presumably speaks well for the legal acumen of her divorce lawyer. The final and toughest puzzle for me involved dealing with the Evil Medicine Man. I had figured out what to do with every useful item I'd found, and without a walkthrough handy, I broke down and hacked into the raw disk image. Buried in the code (in plain ASCII, fortunately) were several references to a wizard appearing out of a broken glass ball, and two inventory items I hadn't seen: a +GOLDEN CHAIN+, which I took to be the final treasure, and a GLOWING GLASS BALL. I thought for a while that I shouldn't have just broken the glass bottle, but was supposed to find some way to melt it down and mold it. But as it turned out, the fabled glass ball was there for the taking at a dead-end room in the marsh -- I had mapped that room after arriving nearby as a result of the RESTORE bug, but the ball wasn't there at that time and I had had no reason to revisit the location. I soon learned that BREAK BALL causes a wizard to appear and kill me, under the mistaken assumption that I am the Evil Medicine Man. Doing the same in the room with the Medicine Man had the same result, unfortunately, but THROW BALL had the desired effect. With all eleven treasures arrayed on the beach, victory is ours! An unusual feature here is that the game doesn't automatically end when we have scored all the points -- we are still free to wander around in the game world and QUIT at our leisure. I enjoyed my visit to The Enchanted Island -- the puzzles were simple, arbitrary and often silly, and there's no plot development to speak of. But it was a fun world to explore, and not a difficult or frustrating experience, so I look forward to playing more of Greg Hassett's adventures in the future. As promised, because I didn't find one online, below the fold is a full walkthrough of the game, with score details. WiiWare -- Just one new game this week, a pick-up-and-play puzzle game called Bang Attack that combines Concentration-style object matching with motion-control object smashing. Wii Virtual Console -- Capcom's Mega Man 4 arrives, filling in one of the gaps between Mega Man 1-3, available on the Virtual Console, and Mega Man 9-10, on WiiWare. XBox Live Arcade -- A double-feature release last week, Capcom's Final Fight: Double Impact, featuring ports of classic coin-op beat-'em-ups Final Fight and Magic Sword. Both are faithful to the original designs, with a variety of display options, original and remixed music, online and local 2-player co-op, and unlockable artifacts in addition to achievements. Very nicely done. Game Room -- Still quiet on the game room front. PS3 on PSN -- Two big releases last week. Capcom's Final Fight: Double Impact (see above), and Telltale Games' Sam & Max: The Devil's Playhouse, the third season of the successful episodic adventure series and the first Telltale title to appear on the PS3 (so far exclusively as far as consoles go). Big Five Software had a major hit with Miner 2049er in the early 1980's -- the game debuted on the Atari 400/800 home computers and was ported to almost every viable platform of the day, although I was personally annoyed that a version for the TRS-80 Color Computer was advertised but never released. At least others got to share my pain later, for hero Bounty Bob's second game was to suffer a similar fate. 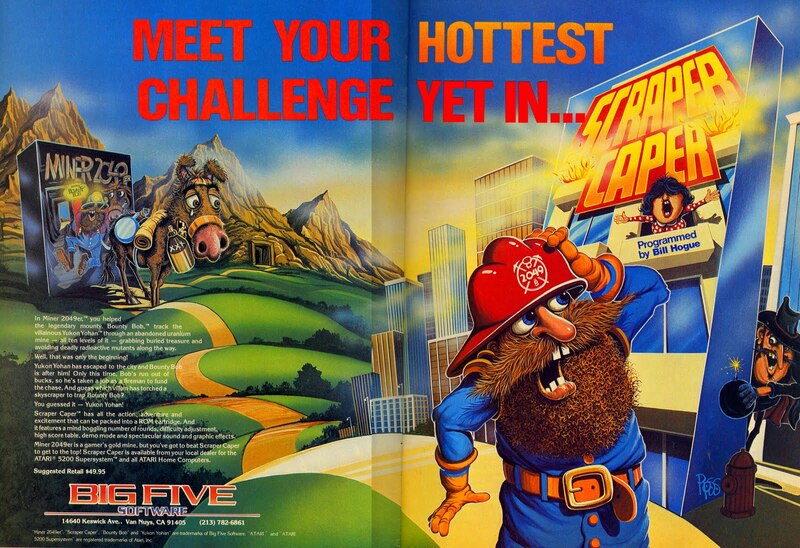 Big Five ran this two-page magazine ad, with new artwork by popular videogame box artist Scott Ross, for Scraper Caper, with Mr. Bob rescuing people from a burning building. But despite the advertising investment, the game never came out. Its failure to manifest at retail can't be blamed on the traditional industry crash/bankruptcy scenario, however. Creator-developer Bill Hogue simply decided Scraper Caper wasn't shaping up as he had intended, and opted to turn his attention to a more straightforward sequel, Bounty Bob Strikes Back. In those days, when preorders were unheard of and game budgets ran into the low thousands of dollars rather than the millions, publishers and programmers had more flexibility to abandon a project. And we still have the ads, the artwork, and the name. The term "vaporware" hadn't entered the techno-lexicon at the time, but the poetry in this case is hard to ignore: scraper and caper both rhyme with you-know-what. I secretly like to think that Bounty Bob's faithful donkey from the Miner 2049er box art, seen weeping in the background of the Scraper Caper ad here, prevailed upon Mr. Hogue to bring Bounty Bob back to the hills and the radioactive, mutant-infested mines. Maybe that boy just warn't cut out fo' the city. Perhaps if the ad had just called it a JAPANESE MASTERPIECE and left it that, it could have worked in a kind of neo-minimalist fashion. A few curious gamers would likely have taken a closer look. 1,000 years ago, an army of malicious Aliens invaded the peaceful city of Kyoto, forcing the villagers into an endless battle with unwelcomed visitors. This is the much talked about video game that took Japan by a storm 10 years in Japan. The sound quality of this game uses the latest in high technology called Multi Matrix Sound System (MMSS). 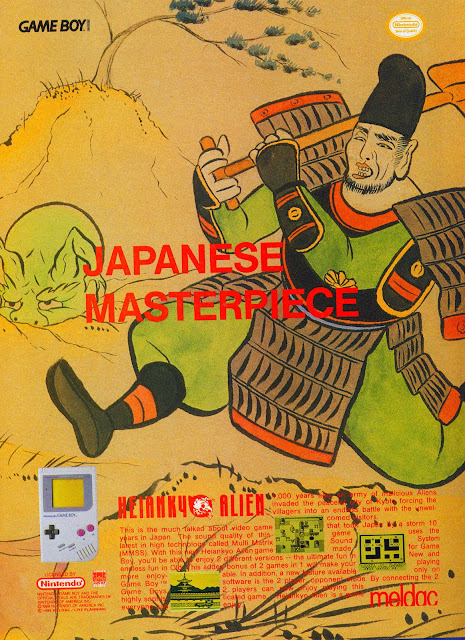 With this new Heiankyo Alien game made for Game Boy, you'll be able to enjoy 2 different versions -- the ultimate fun in New and endless fun in Old. This added bonus of 2 games in 1 will make your playing more enjoyable. In addition, a new feature available only on Game Boy software is the 2 player opponent mode. By connecting the 2 Game Boys, 2 players can now enjoy playing this highly sophisticated game. Heiankyo Alien is a game everyone can enjoy. So all the ad really tells us is that we will be fighting aliens, by some means as yet to be determined, possibly indefinitely, while listening to the presumably pleasing hi-tech emanations of the Multi Matrix Sound System, whatever that may be. There are some screenshots which provide a few hints about the game concept, but the ad doesn't even display the game on the Game Boy unit at the left; a blank screen tends to mean something's wrong in Western culture. Sometimes it's all in the marketing. Heiankyo Alien is a game everyone can enjoy, perhaps; but it did not take America by a storm 10 years in America. Gaming After 40 - One Year In! The Gaming After 40 blog was officially launched on April 16 of 2009, so today marks its one-year anniversary. I'm going to use this post to indulge in a little progress review and invite you, the reader, to let me know how we're doing. So far, we've published over 300 posts, including 28 video podcasts. Since late 2009 I've managed to post something every day, and intend to continue doing so, though I may change up the topic mix a bit. We established a Facebook page, which echoes the blog in a potentially more convenient format, and there are YouTube, iTunes and blip.tv distribution channels for the video podcast. I don't do as much as I could to publicize the blog, so I truly appreciate all the friends and visitors who have linked to it this past year. We got stumbled upon once, linked to as a reference from a Wikipedia entry, and referenced by NPR and several of our fellow bloggers. Looking at what brings visitors here, the most popular topic seems to be adventure games. The Great Scott Project in August of 2009 covered an even dozen of Scott Adams' classic text adventures, and was popular enough to launch the ongoing Adventure of the Week feature. Eventually I'll get to Mr. Adams' Adventure #13: Sorcerer of Claymorgue Castle and beyond to the QuestProbe series, I promise. The video podcasts originated when I ran across an old multimedia game in a dollar store and decided the best way to cover its ineptitude was with video footage. My early efforts were pretty poor in terms of sound and video quality, but I'm happier with the more recent episodes. The show has also become more ambitious, and more time-consuming to produce, as time has gone on, so I may start doing an episode every OTHER week instead of on a weekly basis. The videos seem to reach a different audience than the blog, and even the old episodes continue to draw a few new viewers each week. And I enjoy producing them and learning the tools and techniques involved, so I definitely intend to keep the podcast going. But I have scripted several ideas that will take more than a few days of writing, shooting and editing to put together, and if I'm going to pull some of those ideas off I may have to cut back on the frequency a bit, or find some "cheater" topics I can cover more quickly now and then. The weekend ad posts will continue as long as I can come up with vintage videogame advertisements at which to poke fun. Every week I think I'm hitting the end of the line, but research into the archives continues to be productive. And of course, I'll continue to cover unusual and/or interesting games -- such articles continue to give me a reason to sit down and spend some time with great (and not-so-great) games of all vintages. So that's where Gaming After 40 is at. What I have to figure out next is where it should be going in its second year. So... whether you're a regular reader, or a new visitor randomly running across us, please leave some feedback in the comments for this post and tell me how YOU think we're doing. I'm particularly interested in knowing which features you enjoy and which you could do without. I get some information from the traffic statistics, but genuine reader feedback is more valuable. I'd like you to have a reason to stop by at least once a week and see what's going on here. And thanks very much for reading and watching and stopping by from time to time. Your time and eyeballs are greatly appreciated. YOU even read the whole post. Kudos! It's April 15th in the US, the day when annual income tax filing is due. So it's a good time to look back at an odd Atari 2600 game from a tiny publisher -- Tax Avoiders, written by Darrel Wagner for Dunhill Electronics and published in 1982. 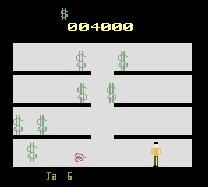 The same developer also produced the Atari 2600 Porky's cartridge for 20th Century Fox, which explains certain similarities -- the player character sprite is almost exactly the same, and the "falling" sound effect is identical. I don't see myself playing long enough to reach the maximum score of one million dollars, but Tax Avoiders is not a bad game -- there's some interesting complexity to it, and the player sprite is nicely animated. It's just another of the many reasonably solid Atari 2600 cartridges that got lost in the shuffle as the market was flooded, triggering the massive industry crash of the mid-1980's. Video Podcast - Do The BERZERK in a FRENZY! This week, 1980's pop songs about killer robots! Rad! If the embedded display isn't visible, you can also find this episode on YouTube. The Gaming After 40 video podcast is also available free in the iTunes Podcast directory. And as of this week, we're also available on Roku set-top boxes -- add the blip.tv channel and search for Gaming After 40! 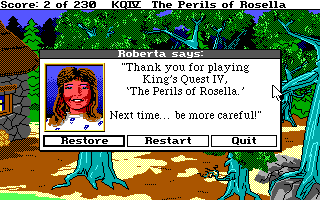 This week, we continue working our way through Roberta Williams' classic animated adventure series, with King's Quest IV: The Perils of Rosella. As one can surmise from the title, this time we are adventuring as King Graham's lovely daughter, Rosella. The game begins with a lengthy opening cartoon, following immediately upon the ending of KQ III, with a few surprises -- so I'll save the details for the spoilers section below. This was the first game released using Sierra's upgraded SCI (Sierra Creative Interpreter) technology, which doubled the resolution of the earlier AGI games, and supported sound cards for more atmospheric sound effects, enhanced by William Goldstein's orchestral score. 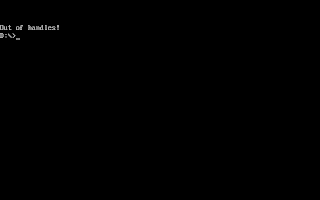 It was also released in an AGI version for computers unable to cope with the then-high-end requirements of SCI, and was the only Sierra game to be developed for both interpreters. Unfortunately, it seems that the challenges of dealing with new technology (and two different builds) sent Ms. Williams back to her design philosophy for the first two King's Quest games -- once again we are exploring a squareish landscape, solving a series of three major puzzles before moving on to a more linear path to the climax. 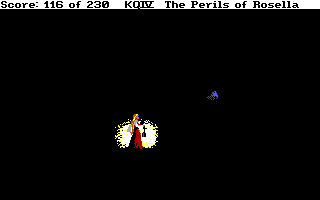 There are more significant emotional moments in this game, as compared to its predecessors, but the impressive dynamic storytelling of KQ III is nowhere to be seen in Rosella's tale. KQIV starts to feel like a throwback immediately, as we are confronted with a copy-protection screen that requires us to look up a word in the manual based on page, paragraph, and word number. I played the game as part of the recent King's Quest Collection, which ships with a PDF manual covering all seven games in the set -- it doesn't reproduce the original game manual, but instead gives us a piracy-friendly table of the keywords for each possible challenge. It's a poor substitute for the more organic and subtle copy-protection of KQIII, which required us to reference spell recipes in the manual. Once we've confirmed that we own the game or have access to the Internet, we are presented with a lengthy opening cartoon that reenacts the final scene of KQIII, with King Graham's throne room looking considerably more lavish in SCI. It was a big secret and rather a big deal at the time -- as the now gray-haired (but no longer yellow-skinned) King Graham throws his adventurer's cap through the air, he suffers a sudden heart attack. 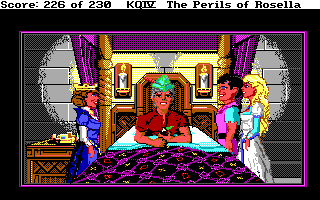 Having played King's Quest V, we know he survives, but for the moment it's quite a traumatic event in the palace. And it's time for the game to get underway -- Rosella's weeping is interrupted by the fairy Genesta, who appears in the throne room's magic mirror to tell us about a health-restoring fruit found only in her homeland of Tamir. Of course, these kinds of solutions don't come cheap -- there's a substantial quest involved in getting hold of said magic fruit. Genesta's land is terrorized by an evil queen, and her own power is fading; she will die in twenty-four hours unless Rosella can defeat the evil Lolotte, return Genesta's magical talisman, and restore order to the land. A bit of transportation magic is invoked, Rosella is disguised as a peasant girl, and she's on her way. 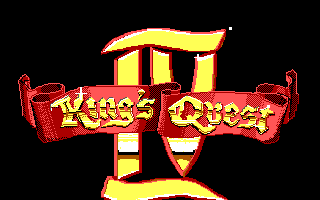 William Goldstein's score for King's Quest IV is clearly an improvement over what the earlier Sierra games could muster, but truly interactive game music was still in the future. Aside from the animated, non-interactive intermissions, which are generously supported, most of the audio consists of atmospheric sound effects and spot music tied to specific events. The SCI technology was ready, but it would take some innovative design thinking to make dynamic game music a reality. There are many echoes of King's Quest I and II in evidence. Lolotte is yet another evil green-skinned witch, and she presents us with three missions that take up most of the game. There are lots of give-this-to-get-that puzzles and classic fairy-tale scenarios that are supposed to give us a hint as to what to do next, and there's not much complexity on offer. At least Lolotte is not a cannibalistic people-eater in this game -- that function is reserved for the ogre and his wife. Something new in KQIV is that we see Rosella rendered in multiple scales, with a wider view used in the outdoor scenes -- it's a nice touch that lends the game a more epic feel. A substantial portion of the game takes place in a spooky old house -- there are lots of doorways and rooms, but there aren't many useful items to find. A latch in the parlor reveals a secret door leading to a stone staircase. At the top is a pipe organ -- and in classic Sierra 3-D adventure style, we have to maneuver between the bench and the organ and type SIT ORGAN before we are allowed to PLAY ORGAN. Nothing happened when I first tried this, beyond Rosella playing a nice organ solo, but later I found some sheet music that produced more interesting results. Unlike almost every adventure game I've played, there are a couple of lamps encountered in the game that we don't need and cannot take. If we try to GET LAMP in the home of the Seven Dwarfs, we are told It belongs to the dwarfs. If we try take the one in the upstairs bedroom of the spooky house, we get the same response; it appears the dwarfs have some kind of monopoly on local light sources, perhaps leasing them out to the citizens of Tamir. We have to attempt to return the dwarves' diamonds to be given one of their lamps from the mine; it doesn't really cast much light at all, but without it Rosella can't even begin to safely maneuver in the dark caves or avoid the creature that lives there. As usual for the King's Quest series, there are some random character appearances and wait-it-out situations to deal with. Cupid can be observed flitting about near a swimming pool, but only on occasion does he stop and go for a swim. When that happens, we can scare him off and obtain his bow, with two very useful arrows. We can shoot the unicorn to befriend the graceful creature, before cruelly handing it over to Lolotte; it's best to save the remaining arrow for later. Rosella was the first female lead in a Sierra adventure, but unfortunate stereotypes still abound. We can't get into the dwarves' mine until we spend quite a bit of non-interactive time cleaning up their filthy house and watching seven different animated characters arrive, eat soup, and leave, one by one, showing off the technology and leaving a small pouch of diamonds on the table as a tip, without so much as a word to Rosella. 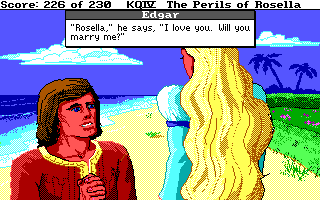 And of course, Rosella is a princess, so she must be beautiful and blonde, attracting the life-saving attention of Lolotte's hunchbacked son Edgar. At least the fairy-tale references are a little more obscure and interesting this time around. A frog wearing a crown sits in the pond -- and if we try to approach him, he gets scared away. We have to find his golden ball, which requires standing in precisely the right location so we can see it under the bridge, mostly so the animation will display properly when Rosella retrieves it. Having found it, we can toss it to him -- when he returns it to us, we can KISS FROG. I like that the transformed prince turns out to be kind of a jerk, turning up his nose at Rosella because she doesn't look like a princess at the moment. But he gives us his gold crown, and we can retrieve the gold ball as well. My favorite character in this game is the minstrel in the meadow, who's not very good -- he's a funny character, and makes good use of the new music drivers as he plays public-domain tunes, hesitantly at best, hitting a lot of wrong notes. We have to find a book of Shakespeare in the spooky house and give it to him, inspiring him to become an actor instead, leaving Rosella with his lute. We can then trade it to the nature god Pan to get a flute, because that's just how things work in these games. Once we are out of the whale, we have to swim directly north, or Rosella tires and drowns, and/or gets eaten by a shark. There's a note in the bottle seeking help with King's Quest I, and I originally thought it was some kind of puzzle -- perhaps, I thought, we would have to send something to a past version of Sir Graham using the bottle. But repeated readings reveal that the note just makes random references to existing Sierra games -- The Black Cauldron, Police Quest, Mixed-Up Mother Goose, Space Quest, and Leisure Suit Larry are all mentioned. As it turns out, we went through all of that business with the whale to obtain the bottle itself, and the note is just a promotional device. Rosella also encounters a fisherman and his wife, two of the crankiest oldsters I've ever met in a game. The fish aren't biting, but the fisherman doesn't want the worm Rosella has in her pocket, and we can't seem to discreetly PUT WORM ON POLE in his house to help him out. There might be alternative solutions, but I opted to give some diamonds to the man, obtaining his pole in return and making his wife much happier. We can now put the worm on the pole and catch a fish from the end of his dock, within seconds of casting the line. How this guy survived to reach old age as a working fisherman, apparently with no knowledge of the arcane and mystical concept of "bait," remains a mystery. There is a waterfall in the game, which means exactly what we think it does, but we can't just walk through it to the hidden room beyond; we have to use the frog prince's crown to turn Rosella into a frog temporarily so she can overcome the currents. Having found a shovel, I spent some time trying to dig for interesting items. In most rooms, the game simply responds NOT HERE; in the graveyard, it says You don't know what to dig for... yet. Later, a number of materialistic ghosts materialize in the spooky house, each pining for some item buried with his or her earthly remains. We must read the tombstones carefully, and save often, as we are allowed to dig in the wrong place at the wrong time, not finding anything should we do so, and the shovel breaks after a limited number of uses. There are a couple of puzzles where we can easily anticipate what sort of item is needed, and the difficult task is to find it. The worst item hunt puzzle in the game occurs on the desert island west of the dock. I knew Rosella needed a bridle with which to lead the unicorn, but had gotten stuck and resorted to a walkthrough to learn that I must have missed it during my first trip to the island. But it's not visible onscreen, and there's not so much as a telltale twinkle to indicate its presence. We have to stand in a specific spot amid some boat wreckage and LOOK GROUND; otherwise Rosella completely fails to detect the unicorn-sized golden bridle. Chances are that by this point most players will have found all of the other interesting items, and the remaining errands will be finished off in short order. After Rosella turns the noble unicorn over to the forces of evil, Lolotte next asks her to steal a golden hen owned by the ogre and his wife. The Ogres' front door is open now, though we can randomly (and fatally) encounter either the ogre or ogress approaching the house. There's a big dog inside who can be fobbed off with a bone, allowing Rosella to steal the ogre's axe, hide in the downstairs closet and watch as the ogre eats dinner and the hen lays a golden egg. We have limited time to sneak out, grab the bird and escape -- at which point the chicken squawks, the ogre gives chase, and we have to maneuver Rosella offscreen as quickly as possible. Neither Cupid's arrow nor the axe is of any use against the enraged ogre, but he can be outrun without too much trouble. Past the dark cave mentioned earlier, Rosella has to JUMP TO GRASS multiple times to get across a dangerous swamp without sinking in the quagmire, then PUT BOARD again to cross the final gap, which does not look much wider than the others. We can then PLAY FLUTE to hypnotize the snake, but the effect does not last long at all; Rosella has to grab the magic fruit and head back as quickly as possible. At this point, darkness falls in Tamir and the ghosts come out in the spooky house. It's interesting to see the landscape after dark, but we don't have to traverse much of the world after hours, having explored it pretty thoroughly during the day. There are zombies rising from the graveyard, but the witches' scarab sends them back into the ground as soon as they approach Rosella. We have to appease a baby ghost by finding its rattle; satisfy an old miser by finding his money; salve a weeping woman's pain by finding a treasured locket; restore a treasure to the lord of the manor; and finally locate a toy for a little boy ghost. This sequence goes on for a little longer than seems strictly necessary, but having pleased all five spirit residents, we at last obtain some sheet music from the chest the little boy ghost has been sitting on. Playing this on the organ yields a skeleton key, which allows us to get into the crypt where Pandora's Box resides. A mummy emerges, but fortunately flees the scarab as quickly as (and more logically than) the zombies. After we take Pandora's Box to Lolotte, of course, we discover that Rosella's promised "reward" is horrific -- she is to be forced to marry Edgar. Ewwww! Locked up in Edgar's room and stripped of her belongings, Rosella is fortunate that the lovestruck young man brings her a rose with a key attached. Finding that out, however, is a bit of a trick; LOOK ROSE consistently returns You see nothing special. We have to use the visual inventory screen and look at the rose, which is (I believe) the only item to come with a text description in addition to the illustration. This fatally overwhelms Lolotte with positive emotions, causing her to collapse in a dead heap. Roberta's text here claims that Rosella thought Cupid's arrows shouldn't have killed her, so that apparently makes it okay. These adventure game royals and their high-handed attitude towards the lives of others! At least Edgar doesn't seem too broken up about it, and Rosella has come to think of him as a friend. Anyway, with Lolotte dead, we can retrieve Genesta's talsiman, recover Pandora's Box and the golden hen, then free the unicorn, undoing much of the evil Rosella has perpetrated. Getting back to Genesta's palace requires Rosella to traverse yet another series of tricky staircases; this part of the game feels like it's unnecessarily padded. Padded... with death! 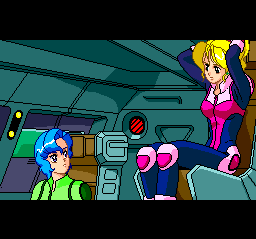 I also ran into a bad save during this section, a fairly rare occurrence with Sierra's engine -- I think I saved during an animated sequence, when I probably should not have been allowed to, and that caused the game to freeze after restoring, forcing me to backtrack to the previous save before I was able to continue. The revived Genesta turns Edgar into a handsome fellow in repayment for his kindness to Rosella, which is another one of those fairy-tale cop-out endings replacing what might have been a far more interesting romance. At least Rosella has more important things to do and rejects his offer of marriage, for the moment. With all the quests wrapped up, Rosella returns home and gives the magic fruit to her dying father. Suddenly King Graham is hale and hearty once again, and ready to star in King's Quest V! When game technology is rapidly advancing, game design sometimes stagnates, and King's Quest IV appears to have fallen into that trap. So it was a bit of a disappointment for me personally -- too much of the same thing we've seen in earlier King's Quest games. But it's still quite playable and fairly challenging. Bigger changes were in the offing a few years later, with King's Quest V.